Two-up is a traditional Australian gambling game, involving a designated "spinner" throwing two coins or pennies into the air. Players gamble on whether the coins will fall with both heads (obverse) up, both tails (reverse) up, or with one coin a head and one a tail (known as "odds"). It is traditionally played on Anzac Day in pubs and clubs throughout Australia, in part to mark a shared experience with diggers through the ages. The game is traditionally played with pennies - their weight, size, and surface design make them ideal for the game. Weight and size make them stable on the "kip" and easy to spin in the air. Decimal coins are generally considered to be too small and light and they don't fly so well. The design of pre-1939 pennies had the sovereign's head on the obverse (front) and the reverse was totally covered in writing making the result very easy and quick to see. Pennies can often be observed being used at games on Anzac Day, as they are brought out specifically for this purpose each year. The exact origins of two-up are obscure, but it seems to have evolved from pitch and toss, a gambling game involving tossing a single coin into the air and wagering on the result. Two-up was popular amongst poorer English and Irish citizens in the 18th century. The predilection of the convicts for this game was noted as early as 1798 by New South Wales's first judge advocate, as well as the lack of skill involved and the large losses. By the 1850s, the two-coin form was being played on the goldfields of the eastern colonies and it was spread across the country following subsequent goldrushes. 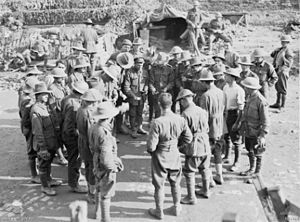 Two-up was played extensively by Australia's soldiers during World War I. Gambling games, to which a blind eye was cast, became a regular part of Anzac Day celebrations for returned soldiers, although two-up was illegal at all other times. As time passed, increasingly elaborate illegal "two-up schools" grew around Australia, to the consternation of authorities but with the backing of corrupt police. The legendary Thommo's Two-up School, which operated at various locations in Surry Hills, Sydney from the early years of the 20th century until at least 1979, was one of Australia's first major illegal gambling operations. The popularity of two-up declined after the 1950s as more sophisticated forms of gambling like baccarat gained popularity in illegal gaming houses and poker machines (slot machines) were legalised in clubs. Legal two-up arrived with its introduction as a table game at the new casino in Hobart in 1973, but is now only offered in Perth's Burswood Entertainment Complex and Melbourne's Crown Casino and Entertainment Complex. Two-up has also been legalised on Anzac Day, when it is played in Returned Servicemen's League (RSL) clubs and hotels. Several tourist "two-up schools" in the Outback have also been legalised. Under the NSW Gambling (Two-Up) Act 1998, playing two-up in NSW is not unlawful on Anzac Day. Boxer Person who manages the game and the betting, and doesn't participate in betting. Cockatoo Only used in the 1800s to late 1930s, due to legalisation of two-up on ANZAC Day. It was the nickname of the look-out who warned players of incoming police raids. The table below show the current bets that can be made at the Burswood Casino in Perth. Single Head 3.125% 1-1 Spinner spins a pair of heads before a pair of tails or odding out. Single Tail 3.125% 1-1 Spinner spins a pair of tails before a pair of heads or odding out. Spinner's Bet 3.400% 15-2 Only available to the current spinner. Spinner spins three heads or tails, before either tailing out or getting the other result. 5 Odds 9.375% 28-1 Spinner spins five odds in a row before either a pair of heads or a pair of tails. A person is selected as the spinner (generally greeted to loud calls of "Come in spinner!" by the rest of the players). The spinner will be tossing the coins in the air using the kip until they win or lose. Two heads means the spinner wins. Two tails means the spinner loses. Odds ("one them") means the spinner throws again. The spinner is required to place a bet before their first throw that must be covered (equalled) by another player. If the spinner wins they keep the bet and cover, otherwise it goes to the player who covered the bet. The boxer takes a commission out of this bet. The other members of the group place side bets (bets against each other) on whether the spinner will win or lose and the result of the next throw. The spinner only wins after successive heads. E.g., if three heads are required before a tails, with any number of odds, then "odds, heads, odds, odds, heads, odds, heads" would be a win. If the spinner throws successive odds they lose. E.g., if five odds thrown before a tails loses while three heads are required to win, then "odds, heads, odds, odds, heads, odds, odds" would be a loss. When played in casinos the spinner's bet is covered by the house, as are the side-bets by the group of punters. Sometimes three coins are used and the bet then is against the spinner who must head them "I bet he tails 'em" rather than "odds em". One of the charities most involved in problem gambling, the Wesley Community Legal Service, a body dealing with problem gamblers, has confirmed it has never encountered a problem gambler addicted to two-up. That is an interesting bit of trivia for everyone to take home with them. Sometimes called "Australia's National Game", two-up is a form of gambling which, though illegal, has long been a favourite pastime. The "Sleeper Catcher", an accepted participant in the game, retrieves bets left on the floor by tardy backers. The Australian rock group AC/DC has a song called "Two's Up" on their 1988 Blow Up Your Video album that references the game. The film The Sundowners contains a sequence in which a group of Australian drovers, including Robert Mitchum's character, play a game of two-up, with appropriate bets. One of the players calls out "fair go", which translates roughly as "play fair". Appropriately, the action in the game on-screen is rapid and without hesitations or false starts. A similar sequence can be found in the 1971 film Wake in Fright. In the 1940 film Forty Thousand Horsemen, the three leads, played by Grant Taylor, Chips Rafferty and Pat Twohill, are introduced to us playing two-up in a market place. In 2009, the television program Underbelly: A Tale of Two Cities shows men taking part in games of two-up. In one instance the police enter the establishment in which this is taking place and the contestants run and hide the equipment being used and money being gambled. In 2014, the television program "Peaky Blinders" depicts a game of two-up, with a car and a horse used for betting. On 20 February 2015, a game of two-up featured in an episode of The Doctor Blake Mysteries titled "My Brother's Keeper" (series 3, episode 2).